We visited on an early Wednesday evening; must be good food and drinks because the place was packed. 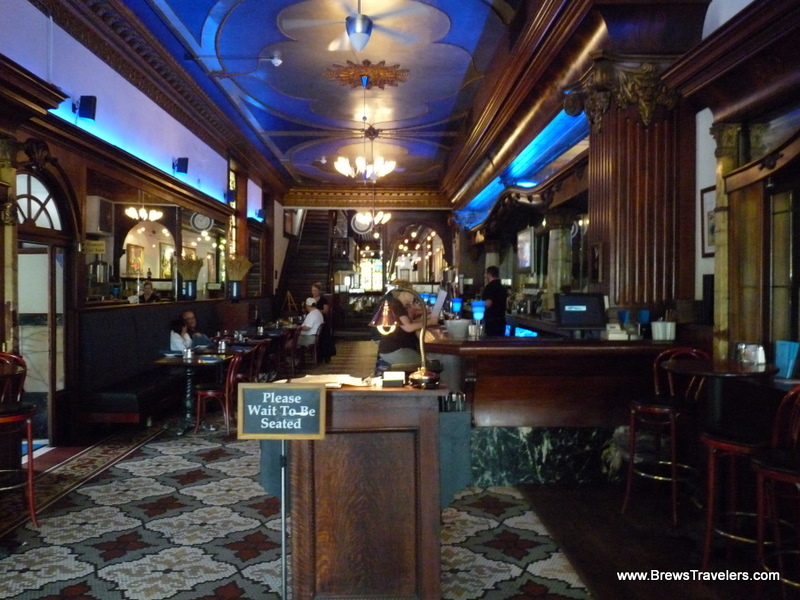 This was originally a billiards and gentleman's saloon. They have their main brewery down the street while this location focuses on their restaurant though they occasionally still brew here. We had a six beer sampler which was $7.50. 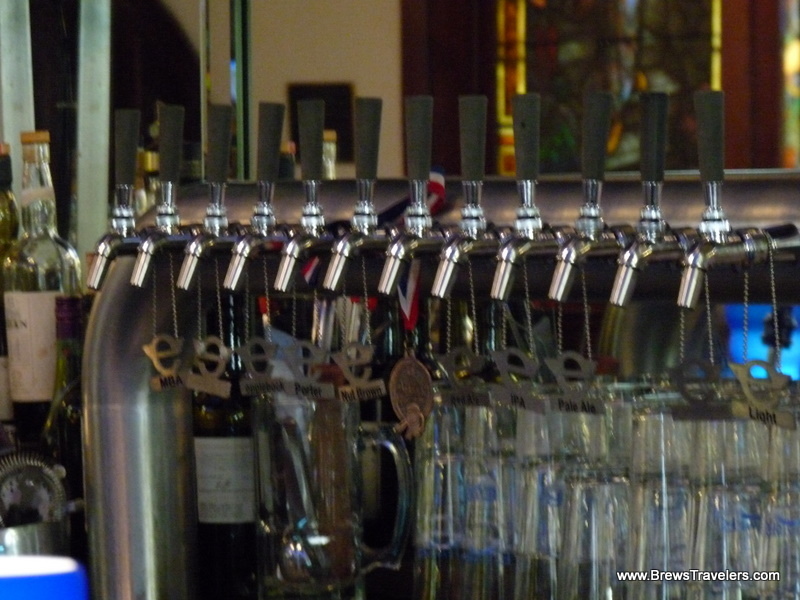 We tried their Kolsh, American Ale, Pale Ale, Dark Lager, Doppelbock, and Barrel-aged Imperial Stout. All were good but the stout was the best of the bunch. Samplers range up to 12 beers (all they had on tap that night) for $1.50 each. There are two bartenders serving everyone at the bar and all the dinner customers; thatâ€™s about 170 customers so service was a bit slow. Happy hour pints are $2.50. We had just eaten at our last stop so we didnâ€™t try any of the food. The place is all non-smoking. Parking is either metered on the streets or at pay lots. We had a difficult time finding parking and ended up several blocks away. 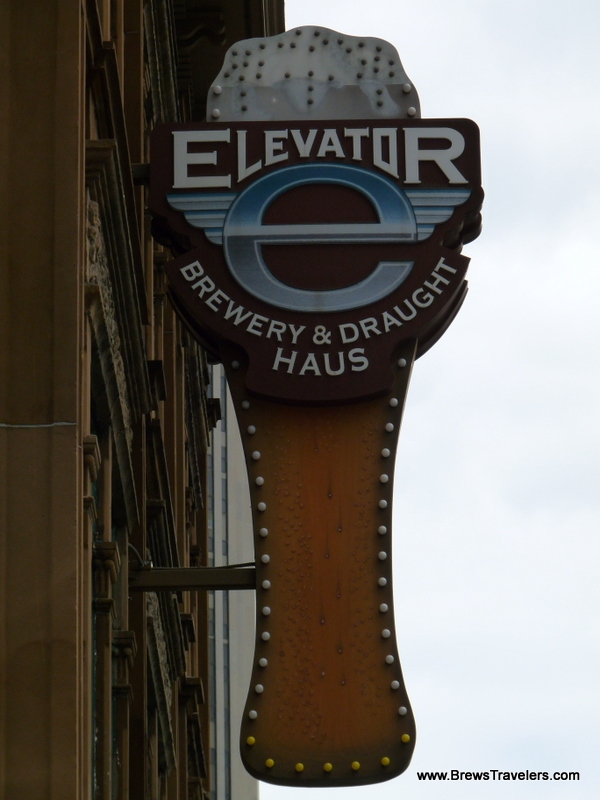 This was my second trip to the Elevator Brewery. Both times I was there during happy hour 4-7pm and the beers were $2.50. Plus they had a happy hour menu with items for $4.95. Since I'm a hop-head I had the Three Frogs IPA first. It was so good I had a second. I also sampled there small batch Over-the-top IPA at 8.5% and it didn't have the balanced flavor of the regular IPA. The over-the-top had a very astrigent taste with no malt backbone. While the Three Frogs was reasonably balanced with a nice malt finish. Then I moved to the Pale Ale....Not good. Enough said. Then I tried the Dark Horse Lager. Not expecting much I was pleasantly surprised with this dark lager. It has a nice hoppie balance to the darkness of the beer. The bar is worth the trip and the beer isn't bad, either. 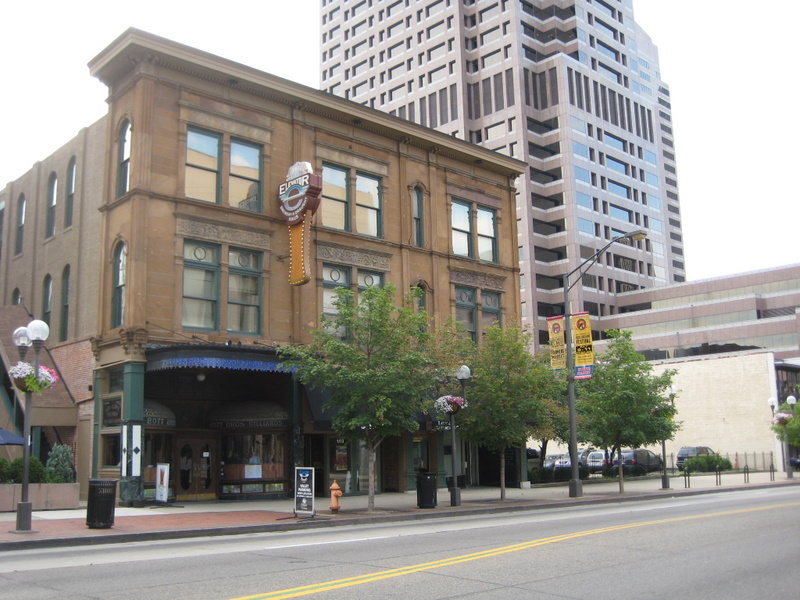 The brewery is located in downtown Columbus in the Arena district near where the Blue Jackets play and also very close to the theatre district. As a result, if you go on the weekend, I'd suggest reservations, it doesn't open til 5 on Saturday, so just random tasting takes a little effort on a Saturday. 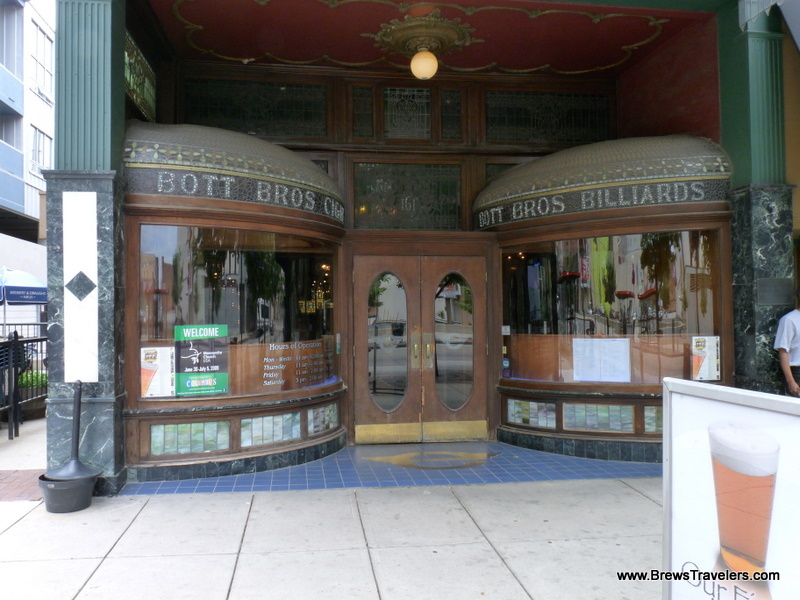 As the previous reviews have said, the building is a great place for a brewery, a very old billiards hall, which they still utilize in the basement. It is up-scale dining for a brewery, the food is definitely good, but it is pricey for a brewery. They have deep fried bratwurst as an appetizer which were very good. The place was extremely busy when I was there, so the service was somewhat understandably slow. The waitress was attentive and did a good job overall. We tried a sampler with IPA, mocha stout (the special MBA beer), red ale, nut brown, dark lager. You can order 3, 6, 9 or 12 samplers. Overall, the IPA and dark lager were probably the best options, although no beer at this place really stood out. Although this place was downtown and it was busy, we were able to find off-street parking and there were a number of pay lots relatively close by as well. First I'll get the beer selection out the way... everything else is great about this place... the beer... is homebrew at best. they have on maybe 10-12 beers, I didn't care for most of them... the lager is your most solid choice here, stay away from the porter... they had on a few stronger servings and I really liked the tripel they had on, but the lager and the tripel, yeah that's it. not a destination, but a nice stop if you're willing to experiment with bad beer... try their specials and samples of their standby's imo. they have a mba program where if you drink the specialty beer of the month... and get a card punched, you're eligible for the larger beer size for the next year... thus bigger pours, less money, you come in at least once a month, bartender said they had a good amount of regulars using this system... not bad elevator. This is a beautiful space. They have a great stained glass entry, a wonderful old tile floor and a unique bar and back bar. Only thing I would change would be to get rid of the blue neon that illuminates the glassware. I also liked the great stained glass backlit pictures, how they made sure to preserve the old ceiling and the dark wood accents. For beer, they had 8 regulars and 3 specials. They had a Vienna, a Wit and an imperial pilsner on special. The Vienna lager and the Porter were very good, the rest were just ok. The Menu, while not huge, is fairly fancy and a tad pricey. There are Thai, Italian, Japanese options plus chops, steaks, burgers, fish. They also have a decent assortment of soups and salads. My spicy tuna appetizer & the fish and chips were both tasty and fresh. The Service was friendly from the hostess to the bartender. The bartender did a good job explaining the specials & regular offerings, but she was a trifle slow with refills. This may be more of a eating then a drinking location, but I thought it is a decent place to have a pint. It is also located right next to the Marriot Courtyard Hotel.